60 or more years of age: 3 tablets 3 times daily. 13 to 59 years of age: 3 tablets twice daily. 3 to 12 years of age: 1-2 tablets twice daily. Note: Our Colostrum is produced using world leader Fonterra ingredients from New Zealand, it is spray dried through low temperature processing to maximise bioactivity. 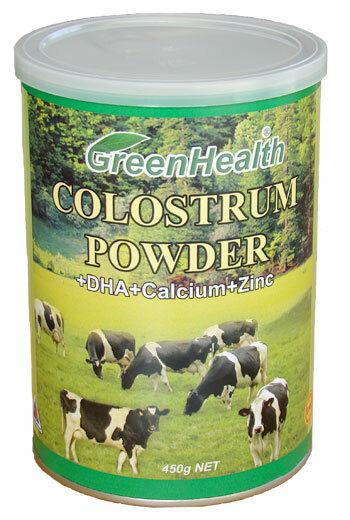 Our colostrum powders are characterised by their excellent flowability, dispersibility and solubility in solution. For best results, mix Green Health Colostrum Powder with a small amount of the liquid or water to make a smooth paste, then gradually add the remaining liquid to the mixture while stirring. For blender mixing, combine Green Health Colostrum Powder with the desired amount of liquid and briefly blend at the lowest speed to minimize foaming. Please mix with boiled water below 50 deg.c. Green Health Colostrum Powder may be mixed directly into prepared foods such as rice, oatmeal, gravy or soup. Take 1 bag daily with meals, It is no suitable for use in children under the age of 12 months except on professional advice. 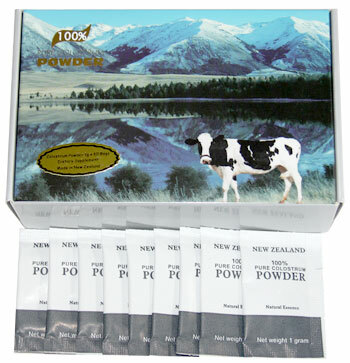 This product contains bovine colostrum powder, lactose, cow's milk protein. Colostrum Hydration Plus 50g New! 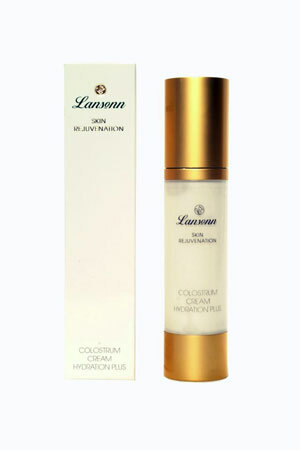 Colostrum with good reason is hailed as the wonder product of the millennium for its ability to act in an anti-aging capacity. The Colostrum Hydration Plus Cream Colostrum Cream is an enriched rich moisturiser which addresses the visible signs of aging and premature aging through the selective use of natural active care ingredients. Also included in the Colostrum Hydration Plus Colostrum Cream are other beneficial milk extracts, Olive oil complex, Macadamia Nut oil, Rice Bran oil, Cranberry Seed oil, Sunflower oil, Jojoba oil, and Kinetin. The rich Colostrum Hydration Plus Colostrum Cream formula provides an ideal winter cream to protect against the elements. Cleanse and dry face. Gently apply to face and neck. Apply as required up to 3 times per day. Colostrum is Life's first and perfect food. It's the "first milk" given by nursing mothers. Colostrum comes in before mother's milk. It is the gift of life. It is SO important to newborn animals, that most DIE without it! Over 37 different beneficial immune factors have been identified in colostrum! Immunoglobulins: powerful antiviral and antibacterial defenders. Lactoferrin: one of the most powerful antiviral and antibacterial substances found naturally in bovine colostrum. Proline-rich Polypeptide (PRP): is the regulating hormone for the thymus gland, the seat of our immune system. -1: (insulin-like growth factors) increases metabolism to burn fat, stimulates T-cell production, accelerates healing, balances blood sugar-high and low, reduces insulin needs, builds lean muscle. Without -1, the body will not burn fat. It also has anti-aging benefits. Bovine and human -1 is the same. Leukocytes: slow viral production and inhibits viral cell penetration. Lysozyme: destroys bacteria and viruses on contact. Boosts immunity. Cytokines: boost T-cells, regulate lymph. It's important to keep lymphatic fluid clean and moving for a strong immune system. Interlukin-10: reduces inflammation in arthritic, injured or infected areas. Glycoproteins and Trypsin Inhibitors: prevent H. Pylori Bacteria from attaching to the stomach wall. And there are others that prevent invaders from attaching to or entering mucous membranes. They block Strep, Leaky Gut Syndrome, E. Coli, Salmonella, Cryptosporidia, Giardia, and more. First, human mothers only produce a small amount of colostrum, and they won't give it up! Cows produce about 9 gallons within the first 24 hours of giving birth! The calf only uses 4 gallons, but 5 are kept for the calf. So, bovine colostrum is much more plentiful. Medical research shows that the most important immune factors and growth factors for humans and other animals can be provided from bovine colostrum. Bovine colostrum is actually ten times richer in immune factors than human colostrum. Interesting Note: Over 80% of infectious diseases are contracted through the nose and outh! Help stimulate normal growth, regeneration and accelerated repair of aged or injured muscle, skin, collagen, bone, cartilage and nerve tissues. Stimulate the body to burn fat for fuel. Helps stimulate normal growth and repair of our body's vital DNA and RNA. Helps balance blood sugars- whether they be high or low. It is an effective topical for burns, cuts and abrasions. Helps with sensitive teeth and mouth sores. Helps maintain blood glucose levels to serve the brain and increase mental acuity. Helps increase seratonin levels to brighten our moods. Lowers cholesterol. Medical studies show colostrum contains powerful immune factors to help fight viruses, bacteria, fungus, llergens and toxins. Many points suggest that colostrum is very useful for helping to correct Leaky Gut Syndrome and many LGS sufferers have found this to be true, especially when taken in conjunction with treatments and regimes. It is completely safe, non-allergenic, non-toxic, has no drug interactions. It is so harmless, it has been prepared by nature as the first food for infants. Colostrum can be used by adults, children, infants, and pets. ANYONE with a poorly functioning immune system can benefit from colostrum! It is important to get colostrum from a reputable source such as NSP, due to differences in processing techniques and integrity. How to use it: If you're not seeing results, you're not taking enough! Most people feel better right away; some will have a "healing crisis", a detox, so to speak. It usually only lasts up to 48 hours as it gets rid of long accumulated toxins. (This may be a good time for Ivy's Colon Recipe!) DO NOT DECREASE AT THIS TIME. Ride it out and MOVE it out! You might even want to increase the colostrum at this time (as your body is healing) to speed up the process. Colostrum is not a by-product of cheese manufacture. All our colostrum products are suitable for vegetarians and are derived directly from the cow's surplus without any additives. The care of the calf is the producer's foremost consideration, its needs come first. Our colostrum is certified by the New Zealand government to be free of BSE. The cows are pasture fed under strict standards. They are not given hormones or antibiotics, and are not exposed to pesticides, heavy metals or other chemicals. "Colostrum; A Journey Toward Better Health & Brighter Tomorrows" by Robert K. York, M.D.